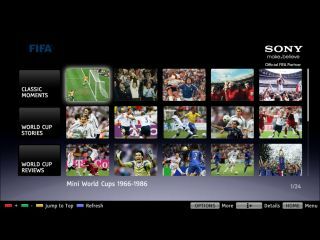 Sony has announced that it is to give its customers a footballing treat this summer, streaming World Cup classic clips to its latest range of web-connected Bravia TVs and Blu-ray players. The content is to be shown through its Bravia Internet Video service, which is Sony's portal for catch-up TV and houses the likes of Five on-demand. The World Cup goodies on offer include: 20 Fifa World Cup Moments (which doesn't really need explaining), 14 Official Films from the World Cup (which includes a colour version of England winning the World Cup) and Fifa Mini World Cup (which shows off highlights of the best World Cup years). Unfortunately for PS3 users this content won't be coming to the system as it uses the PSN and not Bravia Internet Video. And those with an old Bravia set will be annoyed to hear that Bravia Internet Video is a service that's just for the latest TVs – including its 3D-toting HX803 TV – and web-connected Blu-ray players. Other services available on Bravia Internet Video include LoveFilm, YouTube and Facebook. Internet-connected TVs are big business at the moment. Just this week Intel CEO Paul Otellini claimed that these 'smart' televisions are "the biggest change [in TVs] since the move to colour".